Here is my nifty idea to manage my laundry clutter monster. Hopefully it will be helpful to somebody out there! 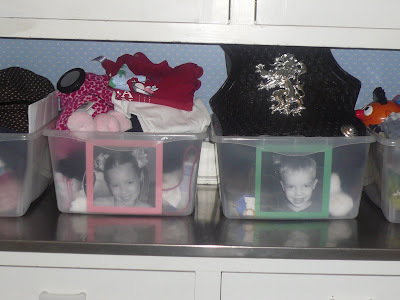 I purchased six rubbermaid containers with removable lids, printed a picture of each person in my family and affixed the photos to the inside of the container using clear contact paper. I fold clothes, right there on the counter and stick it in each person's bucket. One happy day, they will all be old enough to put away their own laundry (Lou does now) but until that day, I have an easier time putting the clothes in the right drawers. If only those buckets would grow legs and arms and put the clothes away for me! An added benefit to having these buckets is clutter management. 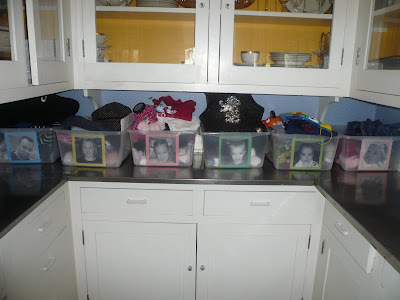 When my kids bring down a toy from their rooms and leave it lying around somewhere, we can stick it in the buckets and it is brought up with the clothes and put away at that time. Now, if I could just figure out what to do with miscellaneous stuff like towels and sheets. I guess I should just fold them and put them away! Novel idea! 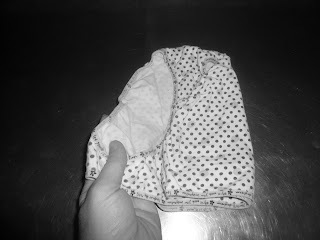 First, you lay the pair of under- wear out flat. 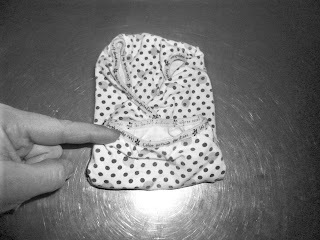 Next, you fold in one side a third of the way over. Then, do the same thing to the other side. 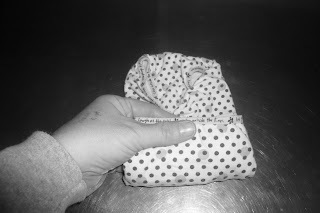 After that, you fold the waist band side a third of the way down. 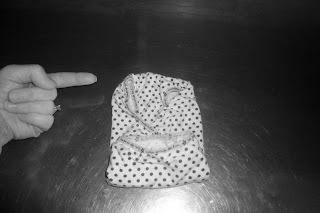 Now, if you pull down the top layer of waist band a little bit, you have a pocket. and stick it in the pocket. There you go. You now have created a little under- wear roll. 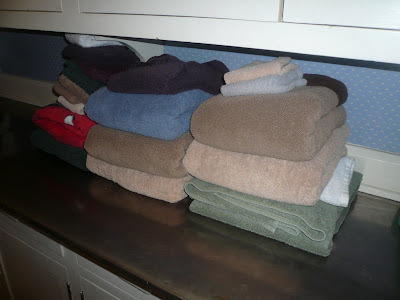 It goes nice and neat in the drawer and stays folded. Try it! You'll thank me, later, when you have a nice, organized underwear drawer. I promise this will be the last post about unmentionables. Maybe. And thanks to my Mom for teaching me neato things that make my life easier! We will never have enough people to need separate bins, however, I am sure it is mandatory for large families. What I learned is that I sure do LOVE you butler's pantry. I wish ours was still intact. So charming! And...only YOU would give an underwear tutorial....lol....but, don't think I won't try it. I am laughing way too hard at the underwear roll, but secretly thinking I may have to give it a try. You are too Funny! The idea about the bins is a good one. I have a friend who has 4 kids, and when they were young, laundry was the bane of her existence. And unmatched socks! Ugh! :D And I agree, your butler's pantry is gorgeous! 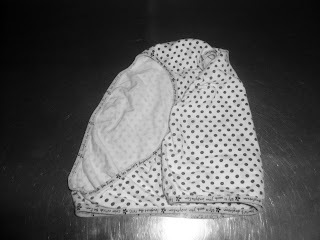 Aww...Shucks...Kudos to Debbie Moss' mom for teaching her to fold underwear like that and she taught me! Here's to Debbie and to sharing things that make our lives easier! I just know Sondre Lyn is going to give it a try and love it! I don't think we'll need the bins, but that underwear roll idea is genius. I'm going to go pull all the underwear out of their respective drawers and roll them up right now. Seriously? You mean there's more to it than just shoving it in drawers and trying to make sure it's not your husband's underwear when you put it on? Man, I'm stayin' around here. I've got stuff to learn girl. 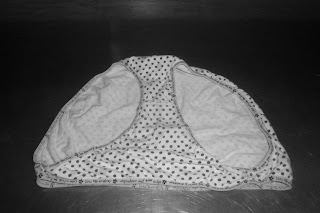 Since you're on about underwear you should LOVE this - you'll die and I know now it would NEVER happen to you! 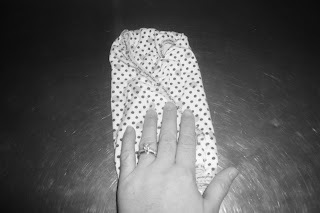 I was just telling Hubby that I need to copy your laundry genius, and then you go and post about it! So crazy. 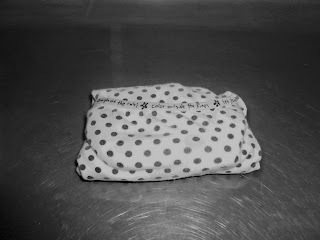 Anyway, I like your underwear folding. But it's all I can do to get the correct undies in the correct drawer. Once I have that mastered I'll try to make those drawers pretty!